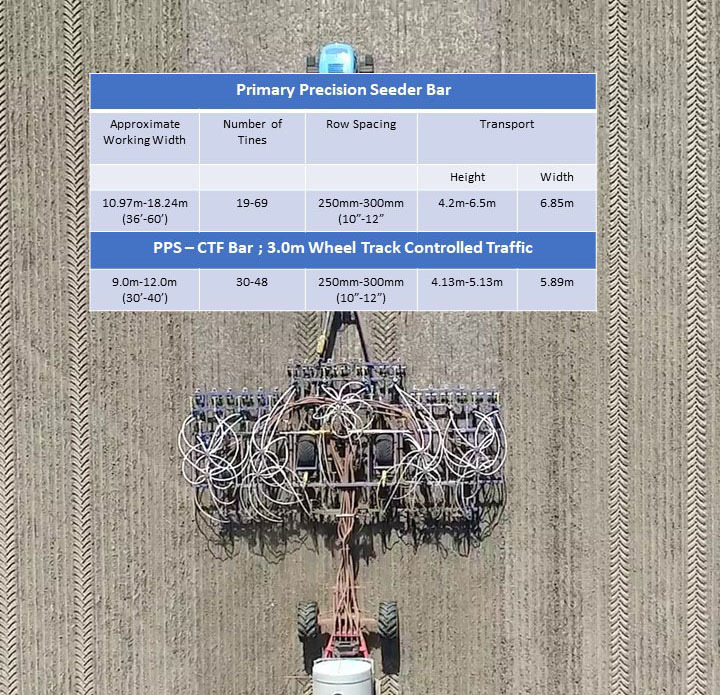 Primary Precision Seeder Bars -The answer to your need for a rugged design with performance and depth control. The deep solid frame structure provides the rigid strength required to cope with tough Australian farming conditions. The PPS Bar is designed and built in Australia for Australian conditions to reduce your overall cost of ownership. 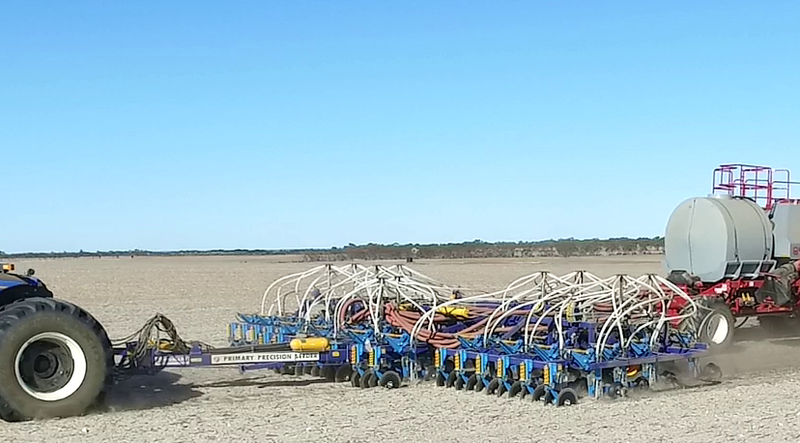 With increasing need for dry seeding the priority for many Australian farmers is getting the seed into the ground for effective soil-to-seed contact and to take advantage of any available moisture at depth whilst completing their seeding program in time to benefit from rain when it arrives. The depth of the Frame allows high flow of trash through the Bar. This combines with the contour following tine module s ability to deliver 1000lbs breakout at the point, giving you more control and ability to maintain effective seed delivery in compact to rocky soil conditions. 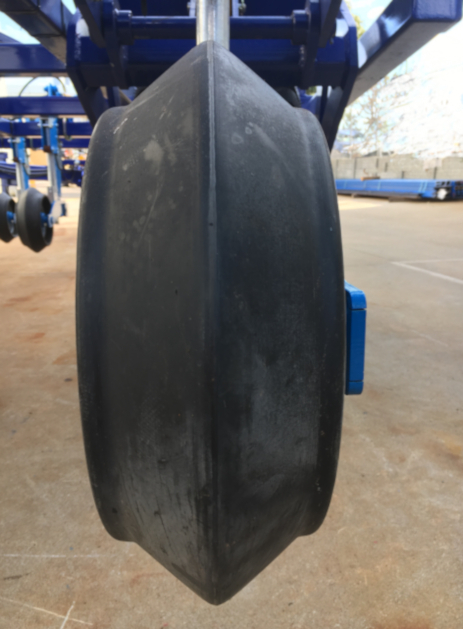 The Floatation Tyres can give a footprint two to three times that of a standard tyre reducing compaction, spreading the load and allowing you onto the paddock earlier. The V Profile Press-Wheel Tyre has optional widths from 80mm to 140mm. These semi-pneumatic tyres flex during rotation to reduce the accumulation of mud. To achieve flourishing crop emergence and yield potential having better control over consistency in seed depth, fertiliser separation and the soil-to-seed contact to suit your specific paddock conditions is essential. The PPS air seeder bar gives the tools and options for your control. Control over seed and fertiliser separation and placement to your conditions, easy seed boot adjustment in 7.5mm increments and control to dig deep or shallow; easy control of working depth of the tine from 5mm to 300mm. Optional Quick Adjuster for tine leg allowing easy 25mm depth adjustment in the field. A range of points, boots to suit paired row, dual and inline seeding are available. Coulter options are available for seeding into dense stubble conditions from tine mount single to bar mount single and twin including Spring or Hydraulic down pressure, all with quick height adjustment and the ability to be pinned up when not required. The Primary Precision Seeder generic specifications are listed to the right. Each tine or coulter can be pinned up as needed allowing wider row spacing for selected crops or lower height road transport. When connected to a valve in the cab the tine pressure can be adjusted on the go to suit ground conditions. The tines are capable of deep ripping to change your paddock viability whilst also being able to till shallow and place seed at your required depth. 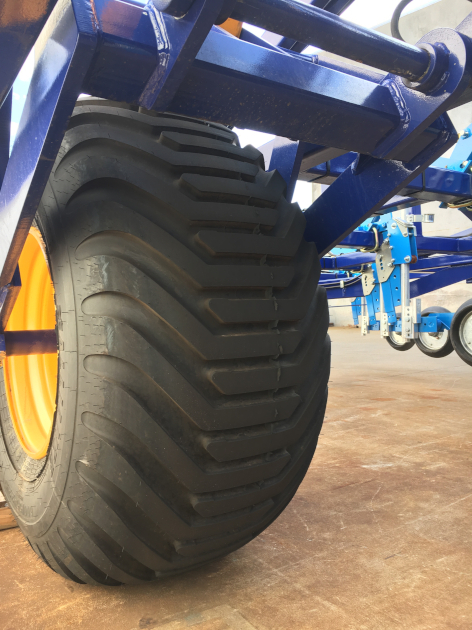 The hydraulic wheel rams allow the bar frame to be lifted to such a height that wheels can be rolled out from under the frame when changing tyres. Or you can even pin up all the tines and lower the frame to a height that you can fit it more easily into a shed for storage. The bar has the capacity to change your soil health and increase your profits.